Nurit Stark really goes for broke in Bloch’s First Sonata. His razory and abrasive tone brings a corrosive quality to a first movement that sounds every inch an Agitato. He and Pescia, but particularly Stark, go on something of a switchback ride here and they are fast and furious, Pescia’s stalking left hand figures re-energising the musical argument, Stark sculpting the quietest of dynamics where required. Elsa Grether with pianist Ferenc Vizi on Fuga Libera FUG711 hover on the edge of audibility in the slow movement whereas Stark’s tone remains more vibrant and projected and the scurrying and evocative playing is certainly visceral. Whereas in the finale we return to the occasionally unremitting resinous drama that so permeated the opening. Love it or loathe it, Stark and Pescia are fully engaged guides. The performance of the Poème Mystique, a suitable appellation for the more fluid and subtle Second Sonata, is very much attuned to its reflective, more elusive qualities. There’s no need here for the kind of bullish extroversion to be found in the earlier work. Stark and Pescia are restrained, thoughtful, colouristic interpreters, exploring the Hassidic lyric episodes at around the ten and twelve-minute mark with acuity and sensitivity. The pianist’s chording is both powerful and beautifully balanced. The structural awareness in the performance is excellent, though not necessarily superior to the competition, which is equally persuasive. 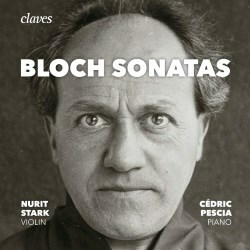 Those wanting more examples of Bloch’s violin works will be disappointed but those who prefer an all-sonata disc will welcome Pescia’s insightful and technically accomplished reading of the sonata that Bloch dedicated to Guido Agosti in 1935, which the Italian premiered the following year in Milan. Though some fifteen years separate it from the First Violin Sonata of 1920 there are correspondences between the two works: both in three movements and both predicated on motoric energy, which in the piano sonata’s case is spiced by Italianate dotted writing in the introduction. There’s little relief in a work that can border on the pitiless, a quality to which Pescia responds with the kind of intensity Stark showed in the First Sonata. If the programme appeals the performances should do so as well. In the case of the Violin Sonatas I have a preference for Grether’s softer grained but more deft readings.